Situated at 25 Queen Victoria Street, on part of the Company Gardens, the South African Museum is the oldest in the country, and was founded in 1825 with Andrew Smith as its first director. In 1832 it had moved to “Garden Machtenburg”, on Looyers Plein. It stood in what is today the beginning of Roeland Street near the corner of Hope Street, and possessed excellent exhibits of many species of animals and indigenous natural objects. Dr. Andrew Smith made this great collection during the Cape of Good Hope Association’s expedition to the interior. In 1838, after the important private collections had been removed, the Museum was acquired by the South African College. 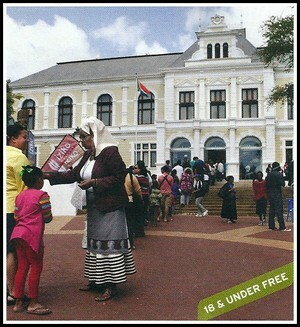 It was moved from Looyers Plein to the Orphan House in Long Street, home of the College, and became a teaching aid. Only in 1855 was it able to resume its independence. Shortly before its removal in 1836 to Long Street, the Museum received a visitor whose work was to revolutionize scientific thinking on the development of animals and plants: CharlesSituated at 25 Queen Victoria Street, on part of the Company Gardens, the South African Museum is the oldest in the country, and was founded in 1825 with Andrew Smith as its first director. Shortly before its removal in 1836 to Long Street, the Museum received a visitor whose work was to revolutionize scientific thinking on the development of animals and plants: CharlesExhibition highlights include San rockpaintings and engravings, which are symbols of the Late Stone Age, a specimen of the extinct zebra-like Quagga and the imposing whale-well, where you can hear wale sounds. The oldest African artworks; the Lydenburg Heads, dating back to 500 BC, Fossils for Africa, and a planetarium, which offers an extraordinary audio-visual experience of the wonders of the universe.